Copper Grill Mat - Are They Better Than the Black Ones? As of this writing, there’s a new kid on the block in the world of grilling accessories and grill tools – it’s the Copper Grill Mat. I’ve been watching the development of this new option with interest. 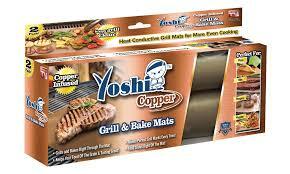 From my observations, it appeared that the Yoshi Copper Grill Mat was the first on the market and, as always happens, there were numerous imitations that quickly followed. A quick search on Amazon earlier today (July 3, 2017) revealed multiple options for purchasing a copper grill mat, which included products from Atiyok, Aoocan, Netcat, Smaid, RVZHI, BestGreen, Looch, Yoshi, and Copper Chef, to name just a few. There aren’t a lot of reviews yet for any of these, since they are a relatively new product. I ordered several of these and will be testing them once they arrive. 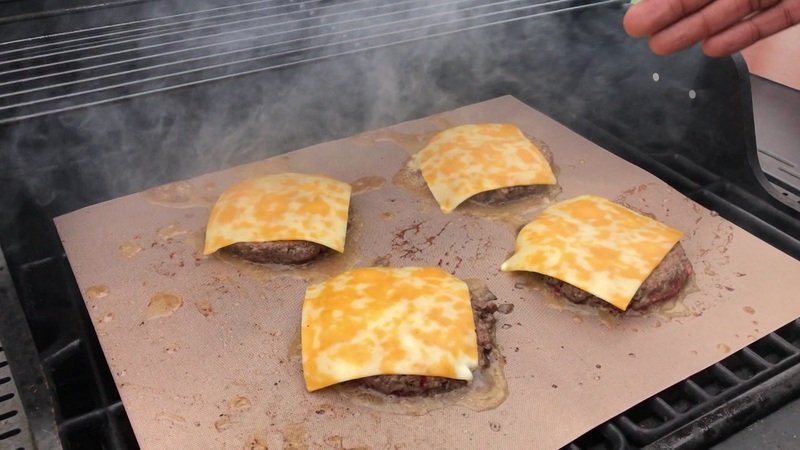 The concept of a bbq grill mat is not new, but the copper grill mat certainly is, though it remains to be seen they are going to be viewed with the same enthusiasm that the original mats have been. I have a series of questions about the copper grill mats that I will be answering in a future post, once I have had the opportunity to test them. If they prove to be an improvement on the original black mats and if they perform as well or better we’ll be creating a Chef Caron version of the copper grill mat. Is it possible to manufacture the copper grill mat with the same or better coeffecient of friction that the original bbq grill mats? This is the feature that gives a mat its slickness and makes it easy to use and simple to clean (in most instances). Does a copper grill mat actually contain copper? Or is that an advertising gimmick because of their copper color? If they do contain copper, are they safe to cook on? Even copper pots and pans normally have a copper colored interior coating. You’re usually not actually cooking on a copper surface. I’ll get into more detail on the copper ingestion issue in my next post on the subject. 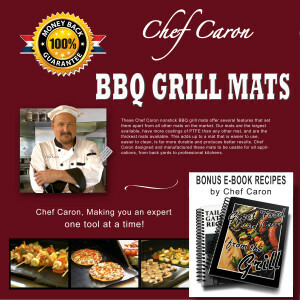 Are they easier or harder to clean than the original bbq grill mats? There are certain foods and sauces, I’ve found, that will stick to a grill mat with a vengeance, particularly when the mats have been subjected to higher heat. So clearly, bbq grill mats do have their limitations in that regard. I’ll be doing tests with the same foods and the same temperatures cooked on a black grill mat and a copper grill mat at the same time. I’ll be videoing this process so those who are interested can see the actual results for themselves. I’m sure once I receive the copper grill mats and start working with them I will discover other aspects and features that need to be tested and verified. Expect to see the results shortly after the Fourth of July. And have a happy and safe 4th.